Recently I had a meatloaf party on my Moore or Less Cooking Facebook Page. You may be asking what is a meatloaf party? Well, this is a party where food bloggers share their recipes, with the theme being meatloaf. All of the recipes shared looked so wonderful. I loved the way this one sounded, so I had to try it! A big plus was that Kyvan’s Sauces sent me samples of their BBQ sauces and Honey. I just had to put their products to the test. They scored and A+! Their BBQ sauce is light and flavorful, not like some other brands that are very thick and goopey. The Blackberry Honey is delicious. Hubs uses honey in his coffee and tea, so we go through a lot of honey, this honey is great! 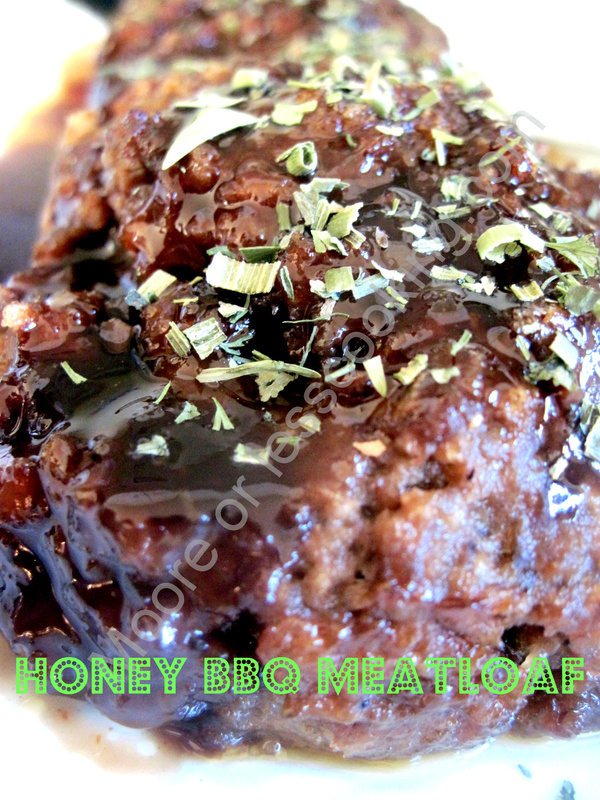 I doubled the recipe for the Honey BBQ Meatloaf, we love meatloaf sandwiches the next day. Good thing I did because my son ate almost 3/4 of a meatloaf. It tastes just like a BBQ burger with BBQ sauce. YUMMY!! Preheat oven to 350 degrees F. Toss one slice of soft white bread in your food processor and grind it into crumbs. In a large bowl, use your hands to mix together the ground beef, fresh bread crumbs, 1 tablespoon of the worcestershire sauce, the spicy brown mustard, 1/4 cup of the barbecue sauce, 1 tablespoon honey, salt, and black pepper. Shape the mixture into a long, thick log and place in an oiled baking dish. Be careful not to pack the meat too tightly or you’ll end up with a very dense, tough loaf. In a small bowl, whisk together the remaining 1/4 cup barbecue sauce, 1 tablespoon honey, and 2 teaspoons worcestershire sauce. Spread half of this mixture evenly all over the meatloaf. Reserve the other half for serving. Bake for 45 minutes. Slice and drizzle with reserved honey barbecue sauce. Recipe adapted from Can you stay for dinner?